Much is spoken on the topic of angels, but little in the way of true doctrine is understood. Many who call themselves Christians have drunk deeply from the well of New Age paganism. Since the Great Apostasy, people get their ideas from all the wrong places. New Agers teach that angels reside within us and are waiting for us to use them to tap our human potential, enhance creativity, provide psychological fulfillment, and spiritual self-enlightenment. Thus promoters of "angel contact" offer people what they want and need in troubled times: assurance, love, and guidance. It is a warped view of Guardian Angels. A couple of years ago, a gentleman at my Church told me about a time when he saw large bones he claimed belonged to beings conceived of angels and human females called the "Nephilim." There are some Protestant sects that actually believe this to be the case. It is based on a misunderstanding of Genesis 6:4. I didn't have time to discuss the issue with the gentleman that day (and I haven't seen him since). This post will give the Church's teaching on angels, and explain the so-called Nephilim. Except where expressly stated otherwise, the teaching of the Church is taken from the writings of theologians Ott and Pohle. 1. In the beginning of time God created spiritual essences out of nothing. It is a dogma declared by the Fourth Lateran Council and the First Vatican Council that "simultaneously at the beginning of time He created from nothing both spiritual and corporeal creation, angelic and mundane." The creation of the angels is directly attested to in Colossians 1:16, "For in him were all things created in heaven and on earth, visible and invisible, whether thrones, or dominations, or principalities, or powers: all things were created by him and in him." (Four of the angelic choirs are mentioned; Emphasis mine). 2. The number and hierarchy of the angels. There is no definitive teaching on how many angels exist, although it is certain they are very numerous. Apocalypse 5: 11, "I heard the voice of many angels...and the number of them was thousands of thousands." The so-called "orders" or "choirs" of angels are not an article of faith, but the theologians hold it to be a theologically certain truth. The theological schools have put them into three hierarchies with three choirs in each hierarchy. The supreme hierarchy has the Seraphim, Cherubim, and Thrones. The intermediate hierarchy is composed of the Dominations, Virtues, and Powers. The lowest hierarchy is made of the Principalities, Archangels, and Angels. It is speculated that the difference in rank is due to the supreme hierarchy assisting at the Throne of God and getting their orders directly from Almighty God Himself. They then hand these orders down to the intermediate hierarchy which, in turn, hands them down to the lowest hierarchy, and the angels bring messages (when necessary) to men. The name angel means "messenger." 3. The angels have an intellect superior to men and are endowed with free will. The angels were given a test, like humans, to earn the Beatific Vision. They were subjected to a probation which a number failed and became demons in Hell. The angels are vastly superior to humans, but cannot produce a true miracle which is something only God can do. The leader of the rebellious angels became known as "Satan" or "adversary" and it is conjectured that approximately one third of the angels followed his rebellion against God, Who created and condemned them to Hell. What was the test? We don't know for certain. Most theologians agree it was a sin of pride. Some theologians speculate that they did not want to serve God. Other theologians, most notably the great Suarez, teach that the sin of pride was in refusing to obey and worship God the Son when it was made known He would take on a human nature (Hypostatic Union). Angels have a general guardianship over the human race. It is good and salutary to pray to them and venerate them. All humans, not just members of the One True Church are given a Guardian Angel upon conception. Theologians agree that even the Antichrist will have a Guardian Angel, but all his efforts to turn him from utter wickedness will be in vain because of the sheer perversity of his will.It is to be rejected that every person also has a demon to tempt him. It is impious to even think God, Who wills the salvation of all, would permit it. Guardian Angels ward off dangers of body and soul consonant with the Will of God. They inspire good and salutary thoughts and covey our prayers to the Throne of God. They assist us at the hour of death and bear the souls of the elect to Heaven. Genesis 6: 2-4 reads, "The sons of God seeing the daughters of men, that they were fair, took to themselves wives of all which they chose. And God said: My spirit shall not remain in man for ever, because he is flesh, and his days shall be a hundred and twenty years. Now giants were upon the earth in those days. For after the sons of God went in to the daughters of men, and they brought forth children, these are the mighty men of old, men of renown." From this verse, comes the idea of a "race of supermen" half-angelic, and half-human. According to theologian Tanquerey, there are many errors concerning angels. Their very existence is denied by atheists, and some Protestants who claim that the angels in the Bible are either good inspirations sent by God, or men sent by God to enlighten others. On the other hand, Some of the Fathers and early theologians were in error regarding the nature of angels, thinking they were united to special bodies. They were led astray by either Platonic philosophy or the verse at hand which they misinterpreted. It is certain that angels are entirely spiritual. (See Tanquerey, Dogmatic Theology (1:372)). Thus the angel Raphael says to Tobias, " I seemed indeed to eat and to drink with you: but I use an invisible meat and drink, which cannot be seen by men." From this we may infer that angels do not have a body but only an apparent body. Since angels do not have bodies, how does the Church interpret the passage? According to theologian Haydock, "sons of God" refers to the godly line of Seth (from whom the Redeemer would come; see Genesis 4:26) who intermarried with the godless line of Cain. At that time, people were preserved by God for long lives; some more than 900 years. God would now shorten their lives to 120 years for them to repent before He would send the great deluge. As far as size is concerned, is it possible that men who lived so much longer, could also have been much bigger in stature? Think of Goliath. It is pagan, and illogical, to think spiritual substances can have carnal relations with humans producing "heroes" much like the pagan Greeks believed about Hercules. Christ said, "For in the resurrection they neither marry, nor are given in marriage, but are like angels in heaven." (St. Matthew 22:30). As with all things theological, we must always consult the teaching of the Church. Those who do not seek out the true doctrine as taught by the Church's theologians on any given issue will fall in error (at best) or into heresy (at worst). The danger becomes apparent in the case of angels. Modernists and atheists outright deny their existence. New Agers turn them into self-help gurus from within, and promote "contact" with them in what will become contact with demons. Others distort the Bible believing in pagan-like "demi-gods" (Nephilim) derived from the alleged union between angels and humans. Pray to your Guardian Angel and ask him to help you learn, and love, authentic Church teaching on any given subject. It's so heartrending to know how to approach VII Sectarians ( & sedevacantist Catholics, to be quite honest,)when they take joy in the "fact" that their miscarried children are now "angels" that can look down on them from heaven. I mean no denigration of anyone here at all, since I have miscarried many children & have 4 adult children too. In recent years I've come to the stance that it's best to address the matter at once, with kindness of course, because Truth is important & in reality truly compassionate & more respectful of the parent who's lost a child. What is your view on this, Introibo, if you do not mind my asking? You could respectfully tell them that human souls are not "angels." Then explain that unbaptized infants are in Limbo enjoying a degree of natural happiness. They are not saints in Heaven. It is important to address this because they may give other woman the impression that if a child is aborted it's "Ok" because they will go to Heaven. Just a kind of unrelated question: Do you read in Latin? I searched many your cited books, and most of them are not translated yet. If you do read Latin, do you have any Latin textbooks to recommend? What do you think about Wheelock's Latin? If you do not read Latin, may I ask where did you get those translations? Yes, I have (limited) reading and writing ability in Latin. All the works I cite I have mostly found in English and some I have passages translated. I recommend "Learn to Read Latin" second edition by Andrew Keller. You're going to give Steven Quayle a heart attack. This is rare and hard to find. So,was Goliath just a large man? Who and what were the Nephilim? Steven Quayle talks about this subject but I can't listen to a Protestant.. He confuses the Catholic Church with the Novus Ordo and refuses to listen to traditional Catholic people on this subject. 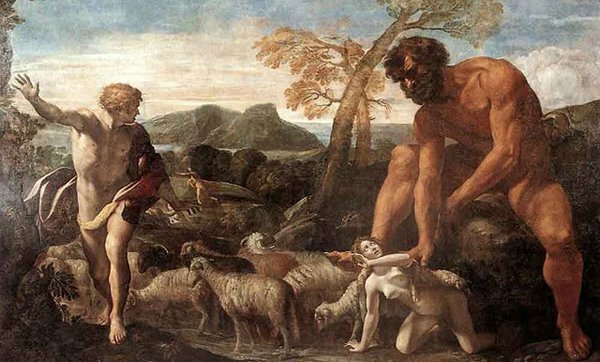 Nephilim were simply large people. Just as people no loner live 900 years, people don't become that large. So,not all grew to Goliath type stature? Some were massive others were average size? Are the Goliath types renowned in Biblical studies for mocking the true Holy God? I ask this in sincerity not sarcasm. There has been so much misinformation on this subject! It seems to have been the children of Seth who intermarried with the godless line of Cain. I will attempt a more in depth response tonight when I have access to my theology library. According to theologian Haydock, "It is likely the generality of men before the flood were of a gigantic stature, in comparison with what men are now. But theses here spoken of , are called GIANTS, as being tall in stature , but violent and savage in disposition and mere monsters of cruelty and lust...There have been giants of unusual size, all historians testify." So, not all were massive, only some. Not all giants were against God, but these hybrids from the godly and ungodly lines, seem to have given themselves over to evil. No mention of the Book of Enoch? It's not part of the Canon of Scripture. It really adds nothing to the discussion as it is not inspired and contains many errors. Book of Enoch is very popular with Evangelical Protestants. They're the only group i've heard mention this particular book. Random YouTube videos and internet articles use the book of Enoch for inspiration but, as a group the evangelicals are the only ones who use it as scripture. Yes, I know it is not part of scripture, but I thought that reading it was the main reason why some people believe the angels came down from heaven and took human wives. I wouldn't pay heed to Enoch, but one must take seriously the inspired Book of Genesis! There is so much confusion in the Novus Ordo with its conglomeration of new age paganism, atheism and Protestantism that it is so good to read sound Catholic Church teaching from sites such as this one. Thanks Introibo!! Thank you for the kind words Joann! I once saw in a blog that the author asserts himself as a traditionalist that this giant, according to the Talmud, escaped the flood by clinging to Noah's Ark. No. Theologian Haydock says he was a giant. However, his proportions may be overstated due to the fact that royal beds were made larger. (Hence, the "King Size mattress" is largest even today). Nevertheless, Haydock concedes that Og could have been 12 to 14 feet tall. Thank you my friend! God bless you and your family and be assured of my prayers. I've never thought about how Satan went about spreading Evil after the Flood. Above comment about Giant hanging on the Arc in the Talmud was interesting and made me realize I've never thought about this before.